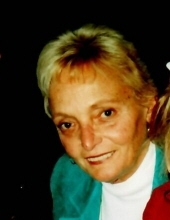 PEABODY- Yvonne M. Talbot, age 81, died August 23, 2018 at Brooksby Village in Peabody after a lengthy illness. Born and raised in Salem. She was the daughter OF THE LATE Rene and Helen (Sirois) Talbot. She was a graduate of Salem High School Class of 1954. Ms. Talbot worked for over 40 years as a supervisor at New England Telephone Company. She enjoyed traveling, shopping, reading and dogs. Surviving her is a brother Roger E. Talbot and his wife Joan of Danvers; a sister Anne L. Dinsmore and her husband Jeffrey Poor of Peabody. Her funeral service will be held privately. Arrangements by Campbell Funeral Home, 525 Cabot Street, Beverly, Contributions may be made in her name to MSPCA. Information, directions, condolences at www.campbellfuneral.com. To send flowers or a remembrance gift to the family of Yvonne M. Talbot, please visit our Tribute Store. "Email Address" would like to share the life celebration of Yvonne M. Talbot. Click on the "link" to go to share a favorite memory or leave a condolence message for the family.